Electronic Beats has decided to close out the year the best way we know how: by giving our readers a bunch of free stuff. This holiday season, we have a ton of autographed CDs and 12″s from EB favorites, as well as free trips and tickets to our forthcoming EB spring festival season, which will hit Warsaw, Bratislava, Prague, and Cologne between February 27 and May 29. We’ve bundled the items into five separate prize packs, which we’ll unveil over the course of the next week, and we matched each batch with a mix from one of five producers who left an indelible mark on 2014’s cultural fabric. In order to score the bounty, you’ll have to listen to the mix and send us as many track IDs from the set as you can. Whoever IDs the most tracks wins the prizes. Our second chosen beatmaker, Arca, isn’t a DJ, and he didn’t make any mixes this year, which means this contest is going to work a little bit differently. 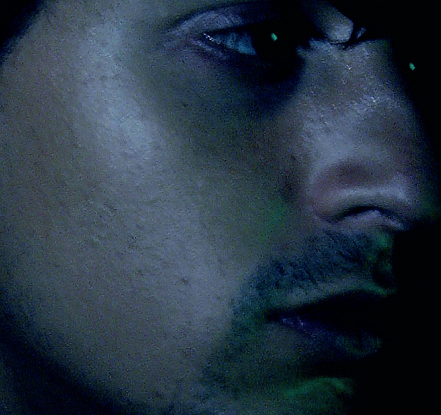 For a producer like Arca, it makes sense to bend the rules, because conventions and traditions are like putty in his hands. The Venezuelan producer broke out in 2012 with the Stretch EPs/albums on UNO NYC, which introduced his warped and mangled take on hip-hop and R&B. As was the case with our last pick for this year-end series, PC Music, I never followed Arca’s work very closely—but I didn’t have to, as his body of work has already reached such great heights that even those who don’t seek it are exposed to it. When he released his &&&&& mixtape/album in 2013, my roommate played it on loop in the studio apartment we were renting for the summer. When stalwart experimental outpost Mute unleashed his Xen LP a few months back, Adam Harper got to work on a recommendation for our magazine, which you can read here. And when he played a live show in Berghain a few weeks ago, I tagged along with a friend to see what the fuss was about. Plus, his high-profile production credits on Kanye West’s Yeezus album and FKA twigs’ LP1 (not to mention a forthcoming album from Björk) were hugely popular in wider spheres. Submit your Track IDs in the form below. Be sure to include the artist name, track name, and the time it appears in the mix using the format time-artist-title (ie. 15:25-Lynyrd Skynyrd-Free Bird). When you’re done, hit Subscribe. Keep an eye out for more chances to win new prizes throughout the next week, and click here to enter our PC Music contest. Elissa Stolman is a former editor-in-chief of Telekom Electronic Beats. Her work has also appeared in Red Bull Music Academy Daily, Fader, Billboard, Vice, Spin and XLR8R. She is one of the founders of the quarterly Salt + Sass event series in Berlin.